Tucson Fire Department paramedics tend to a person who had collapsed on the lawn of the downtown Pima County Public Library in Tucson, AZ. Paramedics transported him to a hospital for evaluation. Photo taken Wednesday, September 2, 2015. This article has been updated to correct inaccurate information about Circle the City. Tucson could get a new respite center for the homeless, modeled after a successful program in Phoenix. A respite center is not a shelter or a clinic. It’s a place where homeless people can go to recover from an illness or injury after they’ve been discharged from a hospital or a place where they can receive hospice care. Betty Bitgood, a Tucsonan who has long been an advocate for the homeless, is the lead organizer for the respite center. A public meeting is planned for Friday, Oct. 23. The Phoenix respite center, called Circle the City, has served more than 600 patients in three years. It has 50 beds and a waiting list 20-deep, Bitgood said. The operating cost for 2013 was about $1.6 million. The group rents a shell building for $1 a month. For some patients, care is paid for through the Arizona Health Care Cost Containment System, Arizona’s Medicaid program. To pay for indigent care, the center raises money. Tucson needs a respite center because it’s hard to recuperate from an illness or injury while living on the street, Bitgood said. She knew a homeless man who had heart problems and needed bed rest, but he couldn’t get rest on the street, Bitgood said. She called paramedics to help him. In another case, she found a man unconscious and called paramedics. Someone told her the man was prone to strokes but he wasn’t getting medical care. TMC caseworkers discharge five to seven patients a week who are homeless. The hospital doesn’t discharge anyone to the street when it’s not medically safe for the person, Woodall said. Sometimes that means the community hospital takes on the cost of hospitalizing the person longer. Tucson doesn’t have anything like Phoenix’s center, she said. The other options here are to send a patient to stay with family or friends or to a shelter. Still other patients insist on going back to the street. 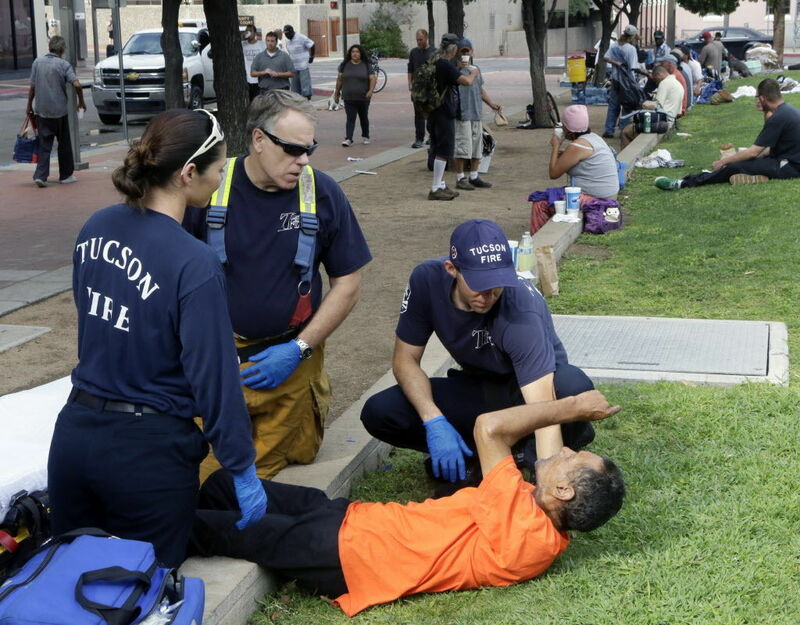 Shelters generally won’t take in a homeless person if he or she is using oxygen or needs wound care, or is in a wheelchair, in some cases, Bitgood said. In other cases, a patient may have missed the daily deadline to reserve a bed in a shelter or may not meet requirements, Woodall said. When a hospital case manager told her about Circle the City in Phoenix, she toured the facility and started planning for a Tucson center. The site is yet to be determined, but Bitgood wants it to be central, close to downtown Tucson. The project also needs partners and volunteers from the political, medical and social service sectors, she said. City Councilman Richard Fimbres, who is holding a series of meetings about homelessness in Tucson, said he is encouraged by the plan and looks forward to hearing about the Phoenix facility. “It is good to see that everyone is rolling up our sleeves to work together to finding solutions to this issue,” Fimbres said. Roughly 1,200 have found homes through program; about 400 more to go. Pastor of The Loving Church says he won't stop feeding the homeless downtown. Legal issues complicate plan to curb urban camping.